Stormy weather won't stop you from having a wonderful and incredible wedding day, but being prepared and having the right mindset can help avoid headaches the day of your wedding if rain is in the forecast. If there is any chance of rain in the forecast for your wedding day, I recommend putting together a rain kit of umbrellas and appropriate footwear and even fun rain jackets. Clear umbrellas are best for photography and allowing the light to come through the umbrellas, while avoiding a color cast on your face from colored umbrellas. Having a different pair of shoes or rain boots on your feet can be cute or even hidden under your dress when taking photo outside in rainy weather. I recommend at least 1 umbrella for every 2 people in the bridal party to ensure everyone is covered. 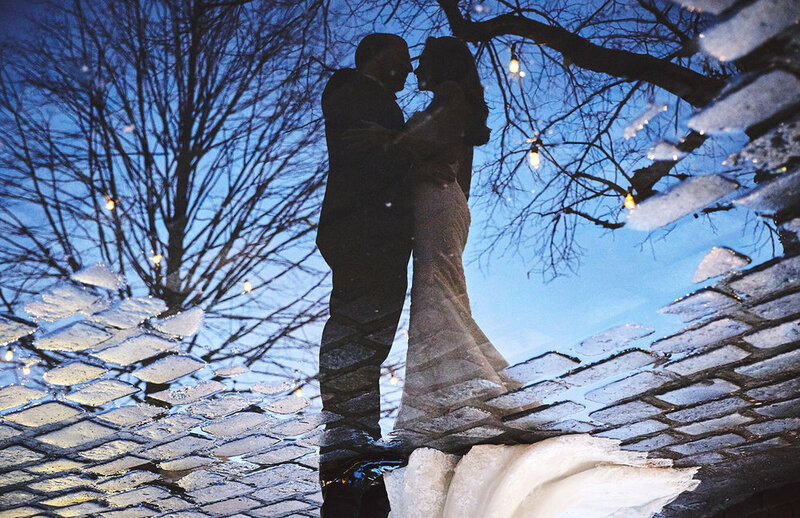 If rain is in the forecast for your wedding day, we will have a discussion on any changes in plans needed and how to get the best photos for your specific wedding and venue. Most venues always have covered areas (example: venue entrances, gazebos, decks, balconies, etc) or beautiful indoor options. We will come up with a game plan on alternative locations that have the best light and backdrop. If rain is in the forecast it might be a good idea to check in with your hair and makeup artists to see if they are available to stay later. That way if your hair and makeup need some help between transporting between locations or photos in the rain you are able to still feel refreshed and confident for the rest of the day. Cloudy overcast weather can be awesome for photography on your wedding day. Overcast weather gives us more options and locations to shoot in where we don't have to avoid the harsh shadows created by the sun. Wedding days are romantic and overcast weather can play into and help create that romantic mood in the photographs. Attitude is one of the most important factors when tackling the rain and schedule changes. Guests, vendors, and everyone is going to take their cues from the Bride & Groom on how to react to the situation. Keeping calming, being prepared, and knowing that there are options to tackle this unique situation will keep everyone in the right mind set to continue to enjoy the celebration. Puddles and rain offer incredible opportunities for creative portraits and photos that are unique and fun.